Dunkin’ Brands Chief Executive Officer and President, Dunkin’ U.S.
Dave Hoffmann is Chief Executive Officer for Dunkin’ Brands and President of Dunkin’ U.S.
Dave joined Dunkin’ Brands in October 2016 as President, Dunkin’ U.S., overseeing all operations, marketing and development for the brand domestically. 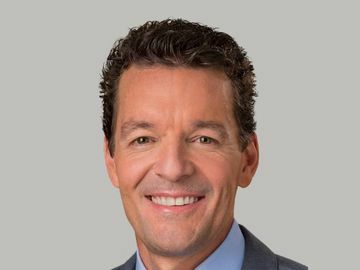 He was appointed to CEO in July 2018, where his responsibilities expanded to include Baskin–Robbins, as well as the international businesses of both Dunkin’ and Baskin-Robbins. Prior to joining Dunkin’ Brands, Dave spent 22 years with McDonald’s Corporation, where he most recently served as President, High Growth Markets, an area that included China, South Korea, Russia and several additional European markets. From 2009 to 2015, he held various leadership roles as part of McDonald’s Asia Pacific Middle East Africa (APMEA), serving as President beginning in 2012 and overseeing the operations of 8,900 restaurants across 37 countries. Dave began his career with McDonald’s as a crew member while in high school and later rejoined the company, post MBA, through its management training program. Prior to rejoining McDonald’s, he worked for Arthur Andersen. Having lived or worked in over 40 different markets around the world, Dave has always been passionate about giving back to his local communities. He currently is actively involved in the Dunkin’ Brands Joy in Childhood Foundation, which partners with children’s hospitals, food banks, and nonprofit organizations across the country bringing joy to kids battling hunger or illness. Dave earned a B.S. in accounting from Indiana University and an MBA from the University of Chicago. Dave is drinkin’ a Dunkin’ Iced Macchiato and scoopin’ Baskin-Robbins Pralines ‘n Cream ice cream.